Victor Seledtsov, Prof., M.D., Ph.D., is the Director at Innovita Research (from 2013). He is also a scientist working in the fields of immunology and allergology. Victor Seledtsov has received his M.D. in 1983 from Tomsk Medical University and continued his postgraduate studies in the Russian Academy of Medical Sciences in Moscow. In 1987 he has received a Ph.D. degree in immunology and continued habilitation and post-doctoral research in immunology, oncology and regenerative medicine, which resulted in Doctor of Medical Sciences degree in immunology in 1998. Also, in 1998, he performed studies at Proneuron, Inc. (Rockville, MD, USA), focusing on the immunobiological properties of the erythroid cell-derived suppressor factor (ESF). 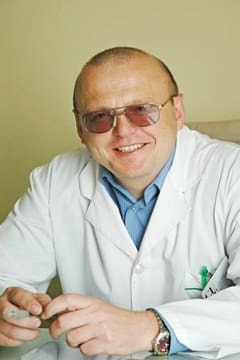 From 1998 until 2007 Dr. Seledtsov was the head of Laboratory for Cell-based Technologies at the Institute of Clinical Immunology (Novosibirsk, Russia). Also, from 1999 to 2001 he was a visiting scientist at John Wayne Cancer Institute, Saint John’s Health Centre (Santa Monica, CA, USA). Later on, until 2016 he was the Director at the Center for Medical Biotechnologies, Immanuel Kant Baltic Federal University (Kaliningrad, Russia). From 2016 he is also director at TechBioMed company (Moscow, Russia). Also, during that time he has been a clinical immunologist/practitioner in allergology-immunology at the Central Regional Hospital (Kaliningrad, Russia). From 2007 Victor Seledtsov is a Professor at the Immanuel Kant Baltic Federal University (Kaliningrad, Russia). He has headed 7 post-graduate students, developed educational graduate and doctorate programs, as well as reads lectures for students in medical and biological faculties. From 2000 Dr. Seledtsov is an editorial board member in Cytokines & Inflammation and Cellular Technologies in Biology and Medicine. He is also a referee in 8 journals. Prof. Seledtsov research results obtained constituted subjects of approximately 180 publications and 12 patents. Immunotherapy for autoimmune diseases; regenerative therapy; immunotherapy for cancer. Direct effects of interleukin-8 on growth and functional activity of T lymphocytes. A possible role for idiotype/anti-idiotype B-T cell interactions in maintaining immune memory. Seledtsov V.I., Seledtsova G.V. Front Immunol.. 2017; 8:409. Direct effects of interleukin-7 on the functionality of human T cells in vitro. Shmarov VA, Malashchenko VV, Meniailo ME, Gazatova ND, Todosenko NM, Melashchenko OB, Goncharov AG, Seledtsov VI. Eur Cytokine Netw. 2016; 27:102-7. Immune responses to polyclonal T-cell vaccination in patients with progressive multiple sclerosis. Seledtsova G.V., Ivanova I.P., Shishkov А.А., Seledtsov V.I. J Immunotox.. 2016; 13: 879–84. Xenonogeneic cell-based vaccine therapy for colorectal cancer: association of clinical effects with vaccine-induced immune responses. Seledtsova G.V., Shishkov A.A., Kaschenko E.A, Seledtsov V.I. Biomed Pharmacother.. 2016; 83: 1247-52. Xenonogeneic cell-based vaccine therapy for stage III melanoma: safety, immune-mediated responses and survival benefits. Seledtsova G.V., Shishkov A.A., Kaschenko E. A.,. Goncharov A. G., Gazatova N. D., Seledtsov V.I. Eur J Dermat.. 2016; 26: 138-43. Erythropoietin exerts direct immunomodulatory effects on the cytokine production by activated human T-lymphocytes. Todosenko NM, Shmarov VA, Malashchenko VV, Meniailo ME, Melashchenko OB, Gazatova ND, Goncharov AG, Seledtsov VI. Int Immunopharmacol. 2016 ; 36: 277-81. A novel dual NO-donating oxime and c-Jun N-terminal kinase inhibitor protects against cerebral ischemia–reperfusion injury in mice. Atochin D.N., Schepetkin I.A., Khlebnikov A.I., Seledtsov V.I., Swanson H., Quinn M.T., Huang P.L. Neurosci Lett. 2016; 618:45-9. Clinically feasible approaches to potentiating cancer cell-based immunotherapies. Seledtsov V.I., Goncharov A.G., Seledtsova G.V. Human Vaccines & Immunotherapeutics.. 2015; 11(4):851-69. Dexamethasone effects on activation and proliferation of immune memory T cells. Gutsol A.A., Sokhonevich N.A., Seledtsov V.I., Litvinova L.S.Bull Exp Biol Med. 2013;155(4):474-6. Investigations of cellular immunity in different stages of liver fibrosis. Seledtsov V.I., Seledtsova I.A., Gazatova N.D., Volchek E.I., Sidorova E.I. J. Hepatology. 2013; 58 (s1): 296. A balance between tissue-destructive and tissue-protective immunities: a role of toll-like receptors in regulation of adaptive immunity. Seledtsov V.I., Seledtsova G.V. Immunobiology. 2012; 217: 430-5. Seledtsov V.I. Shishkov A.A., Seledtsova G.V. In Current Cancer Treatment – Novel Beyond Conventional Approaches, Prof. Öner Özdemir (Ed. ), ISBN: 978-953-307-397-2, InTech, 2011: 416-428. DOI: 10.5772/23671. A remedy for full-thickness defects in an articular surface. Belogorodtsev S.N., Samarin D.M., Seledtsov V.I., Kolosov N.G. Patent RF 2319465, 20.03.2008..
A remedy for hepatic diseases. Velichko A.Ya., Kolosov N.G., Seledtsov V.I., Seledtsova G.V. Patent RF № 231852, 10.03.2008..
A remedy for brain and spinal cord injury. Rabinovich S.S., Seledtsov V.I., Samarin D.M., Savchenko S.A. Patent 229093, 10.01.2007..
A technique of preparing a polyclonal T-cell vaccine designed for treatment of immunologic disorders. Seledtsov V.I., Ivanova I.P., Samarin D.M., Kozlov V.A. Patent RF, № 2277422, 10.06 2006..
A remedy for the infantile cerebral palsy. Rabinovich S.S., Seledtsov V.I. Patent RF, № 2233665, 10.08.2004..
A mode of implanting stem cells in experiment. Karaskov A.М., Larionov P.M., Lensky A.G., Boyarskich U.A., Ivanov D.V., Kliver E.E., Chernyavskiy А.М., Omarov A.A., Marchenko А.V., Vasilyeva M.B., Burdina A.O., Litvinova T.A., Kozlov V.A., Seledtsov V.I. Patent RF, № 2237440, 10 10. 2004..
A remedy for traumatic spinal cord injury. Rabinovich S.S., Kozlov V.A., Kolosov N.G., Ivochkin A.M. Patent, RF, № 2195941, 20.01.2003..
A technique of vaccine therapy for cancer diseases. Seledtsov V.I., Samarin D.M., Seledtsova G.V., Senyukov V.V., Strunkin D.N., Kozlov V.A. Patent, RF, № 2192883, 20.11. 2002..
A vaccine for stimulating antitumor immunity. Seledtsov V.I., Samarin D.M., Seledtsova G.V., Senyukov V.V., Strunkin D.N., Kozlov V.A. Patent RF, № 2192884, 20.11. 2002..
A cytoatatic factor of natural origin and a technique of its preparation. Kozlov V.A., Tsyrlova I.G., Seledtsov V.I., Seledtsova G.V., Samarin D.M., Senyukov V.V., Akimenko Z.A. Patent RF, № 2233663, 09.07.2002..
A remedy for traumatic coma. Efremov A.V., Ivochkin A.M., Rabinovich S.S., Seledtsov V.I., Taraban V.Ya. Patent RF, № 2160113, 10.12.2000..